My friend Chelle over at Tempting Persephone is hosting a wonderful challenge called Pursuing the Lioness. This event is a chance for those who have not yet discovered Tamora Pierce's phenomenal Alanna books (the Song of the Lioness quartet) to read one or all of them and post about the experience sometime over the next six months. And for those who know and love Alanna already, Chelle is asking for guest posts about your favorite book, character, or memory associated with the series. Most of you know what a pivotal series this was for me growing up and so you can guess how much this event gives me the deep tingles. I'll be helping kick off the festivities with a guest post on the 18th. I hope you'll take part as well. See you there! A few days ago I was over on Twitter rhapsodizing about my love for The Demon's Lexicon and all things Alan & Nick, when the Ana-half of The Book Smugglers hinted I should head over to Sarah Rees Brennan's site to read the short story "Nick's First Word." Naturally, I hightailed it over and Oh.My.Word. Seriously, you must go read it if you have read The Demon's Lexicon. If not, why have you not? Don't look at me like that. Go. Now! And while I was there I stumbled across the most awesome graphic novel-style art of the four main characters. Plus, there are wallpapers! I mean, how awesome are these two? With the sword and the gun and the...? So cool to be able to share this one with you as well! I LOVE Alan, LOVE ALAN! I started TDL this fall but I haven't read much more than 40 pages. I have to try again soon. I have never read Tamora Pierce, but that's something I'll try to remedy this year. I put The Demon's Lexicon on my TBR list, too. It's currently #430. I can't wait to see what you come up with for the guest post! Also, I'm starting THE DEMON'S LEXICON tonight. Okay, okay! I feel sufficiently chastised for not reading the book. ;-) I've added it to my list and on my next library run, this will be on it! Ladybug, I'm glad you know you do. :) The Alanna quartet is the place to start. Brenda, LOL. I feel your TBR pain. When it does come around, though, I don't think you'll regret it. Chelle, woot! K, you are in for a treat. Just soak it all up. hehe. 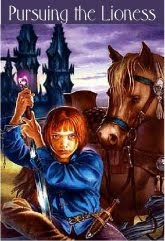 An obsessed friend got me started on Tamora Pierce with the Alanna books, which I liked a lot. Unfortunately, I haven't gotten around to reading any her other series yet. I have yet to read the Demon's Lexicon, but added it to my to read list after your great review! This looks really good. I havent read anything like this before. Bored_D, sounds like a good friend. :) I recommend moving on to either the Kel or Daine books after Alanna. The Protector of the Small or the Immortals series. Both good stuff. Let me know when you get around to LEXICON. Love that book. The person who wrote The Demon's Lexicon must have been a master mind to write such a wonderful book. Now I have it gathered on my bookshelf with all the rest of my collection of books.